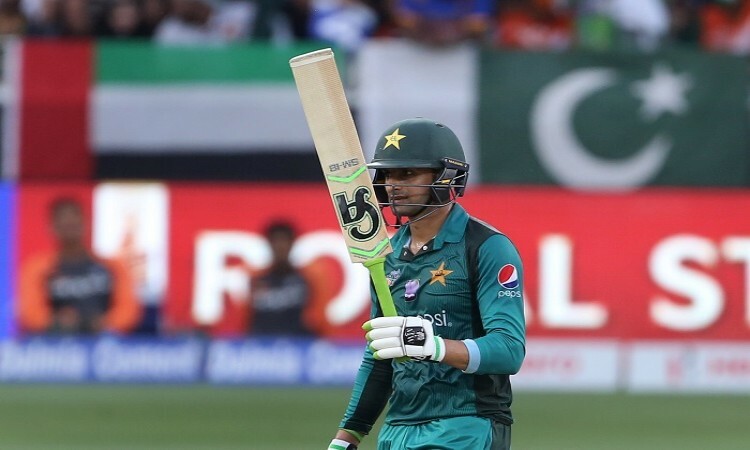 Dubai, Sep 23 (CRICKETNMORE): Shoaib Malik's disciplined innings along with useful contribution from Sarfraz Ahmed helped Pakistan post 237/7 against India in the Super Four tie of the Asia Cup at the Dubai International Cricket Stadium here on Sunday. Malik scored 78 runs in 90 balls and Sarfraz made 44 runs in 66 balls to forge a crucial 107-run fourth wicket partnership to guide their team to a respectable total. Electing to bat, Pakistan started off on a decent note, forging a 24 run partnership for the first wicket before opener Imam-ul-Haq (10) was dismissed by Yuzvendra Chahal in the eighth over via Decision Review System (DRS). Fakhar Zaman (31), who seemed good in the middle was the next to go. He was adjudged leg before wicket off Kuldeep Yadav in the 15th over. Soon Babar Azam was run out while trying to steal the single off Ravindra Jadeja. With three wickets down at just 58 runs, experienced duo Malik and Sarfraz joined hands and took Pakistan out of troubled waters. The duo stitched a brilliant partnership, hitting some glorious boundaries and sixes. Just when things were going smooth for Pakistan, Kuldeep broke the partnership, taking Sarfraz's wicket in the 40th over. Unperturbed, Malik kept on playing his shots and maintained a good run rate. But while trying to increase the run rate, Malik gifted a simple catch to Mahendra Singh Dhoni off Jasprit Bumrah. He slammed four boundaries and two sixes. Towards the end, Asif Ali (30) also contributed handsomely along with Shadab Khan (10) Mohammad Nawaz (15) to complete the innings at 237/7 in their allotted 50 overs. For India, Bumrah, Chahal and Kuldeep took two wickets each. Brief scores: Pakistan 237/7 (Shoiab Malik 78; Jasprit Bumrah 2/29) against India.